This is what a 25% drop in a nation's economy does to people. Stefanos Zouridakis runs a family shop in central Athens. Like his father and grandfather, he is selling bags, wallets and all kinds of luggage. Called "Zouridakis" to honor the family name, the store used to stand proud in the middle of a busy shopping street minutes away from the Greek parliament. Now it's pretty much the only one left there. The only one that hasn't collapsed during the economic crisis. 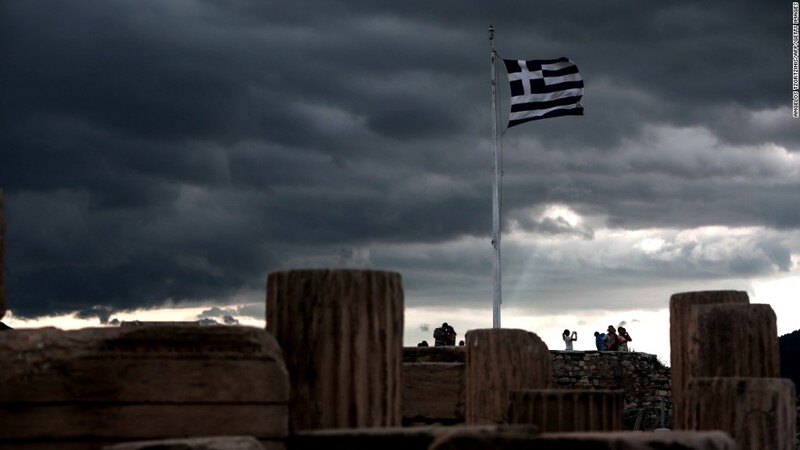 After five years of austerity, Greece is back in recession. In Athens, the downturn is visible on every corner. Abandoned shops and neglected buildings line even the busiest streets of the historic tourist districts. With household income dropping by a third between 2007 and 2014, money is tight. "I am paid quite well, compared to many, but I am still worried about the future," banker Nikos Kontzialis said. His salary has stayed flat for the past five years, but he pays between 10 and 15% more in taxes. "We don't spend too much money, we go out a lot less than before," he said. "It's like there is no light at the end of the tunnel." He is not alone -- IMF data show that private consumption has dropped around 30% since 2010, with food consumption down 28%. As Greeks tightened their belts, companies suffered. Around a fifth of the country's private businesses have folded since 2010, and unemployment skyrocketed from 10% in 2010 to 27% in 2014. The unemployed and pensioners are hit hardest. Pensions have been slashed by as much as 60% to average 830 euros a month ($930). Greece experienced one of the largest falls in real wages across OECD countries (more than 5% per year on average since the first quarter of 2009). At the same time, prices have been rising. Renting a small apartment in Athens costs around 300 euros a month ($336) and a monthly metro ticket is 30 euros ($34). 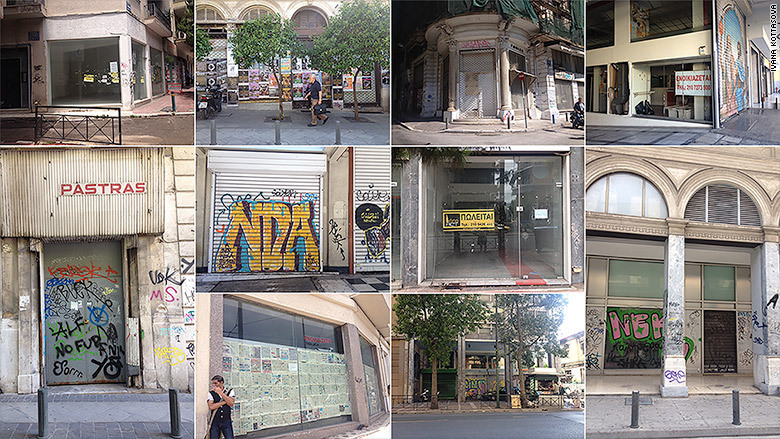 Stores in central Athens stand abandoned. With high unemployment, pensions are the main source of income for many families. Konstantinos Papageorgiou's family is an example of this new reality. Apart from a few short-term gigs, he has not been able to find a job in the two years since finishing university. He lives with his parents, who are both retired, and support themselves and him with their pensions. "There are too many people who are not that lucky, who don't have family to help them," he said. 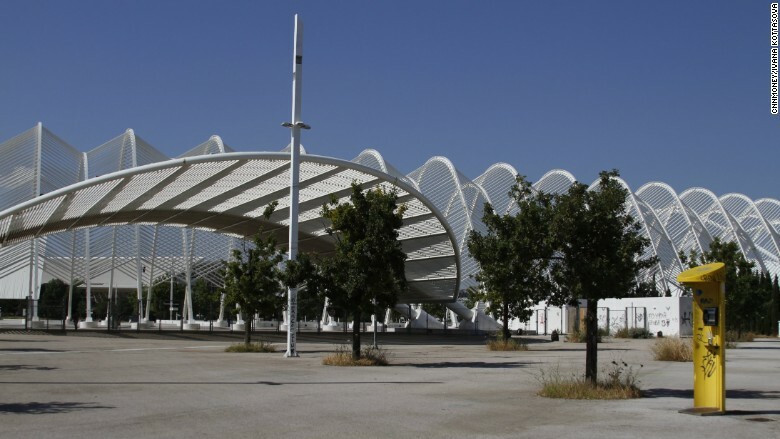 Just a few miles north of the Athens city center is the abandoned Olympic stadium. Once the symbol of Greece's proudest moment, the site is now a brutal reminder of how much has the country suffered in the last seven years. With rusty structures and empty fountains, the walls defaced with graffiti and trash scattered around, it's hard to imagine that it was all shiny and new just 11 years ago. The cost reached estimated 9 billion euros ($10 billion), at the time the most expensive Olympics ever. The Greeks opened new roads, metro stations, even an airport. But the spending took its toll -- in 2004, the budget deficit reached 6.1% of the GDP, double the 3% allowed by the eurozone rules. The spiral of debt knocked Greece down to its knees and eventually led to the 240 billion euros international bailout, now fiercely debated in Europe. For Christina Katsoulou, the 2004 games were the proudest moment of her life. "We didn't believe Greeks could do such a big thing," said Katsoulou, who is employed as an administrative worker in the aquatic center. "Everything was newly built, clean, it was beautiful feeling, like if we finally became European. The Olympics...that was the best time of our lives." She added, "Now we have to think about how we survive."